Discussion in 'Natural Parenting' started by KX, Dec 5, 2006. I was raised on cloth as my mum reitterates to me all the time. Can someone tell me exactly what it is I need, and where is the best place to buy from? I would like snazzy/fancy/girly designs-is this just covers you buy? Also paper liners-are they not harsh on the baby? Sorry I cant be of a lot of help, as its all a bit of a mad science to me but I found this site with is a great help, you put in all your requirements of what sort of thing you need, baby age, quick drying, environmentally friendly, easy to use etc and it lists the nappies most suitable for your needs. Happy Hinys come up as the best for me and they looked really nice. Let's presume you want to wash every other day, I'd go for at least 12 nappies. Paper liners can be soft but if you're concerned opt for washable fleece liners. Dirt cheap or make your own! Cat mentioned a good site for finding what's good for you. The nappy lady and twinkle on the web websites also offer a similar service. I agree with Minxy about finding what's best for you. Personally I love Wee Notions nappies and wraps. www.weenotions.com. The microfibre nappies are really soft, they have a built in fleece liner (shake the poo down the loo), and a built in booster but you can add more if she's a heavy wetter. The leg elastics are also adjustable so you can make them smaller/bigger as Rebecca grows. They come in lots of pretty colours, but you're going to be covering them with a wrap anyhoo. I wish I'd gotten more neutral nappies now as it's the wraps that are on show. The Wee Notions wraps are really good, they've never let me down with regards to leaks, you can choose everything from the pattern on the outside to the colour of the waterproof layer on the inside and the binding. I've got girly ones and funky ones. Wee Notions also do some gorgeous pocket nappies, which like Minxy said, you just stuff the inside pocket with boring boosters which are hidden. You can get bright pink flowery ones or even animal print ones, they've got some great fabrics. I used www.babykind.co.uk when I placed my initial order and their website is really good at explaining what you need to go with what nappies. Not much I can add to what minxy and Kina have said. I use pockets for night time as I can pad them to make them more absorbant. During the day I use the two part system with a shaped nappy and a wrap. There are some fab ones out there. I have some photos that I will upload and try and remember where I got them from. 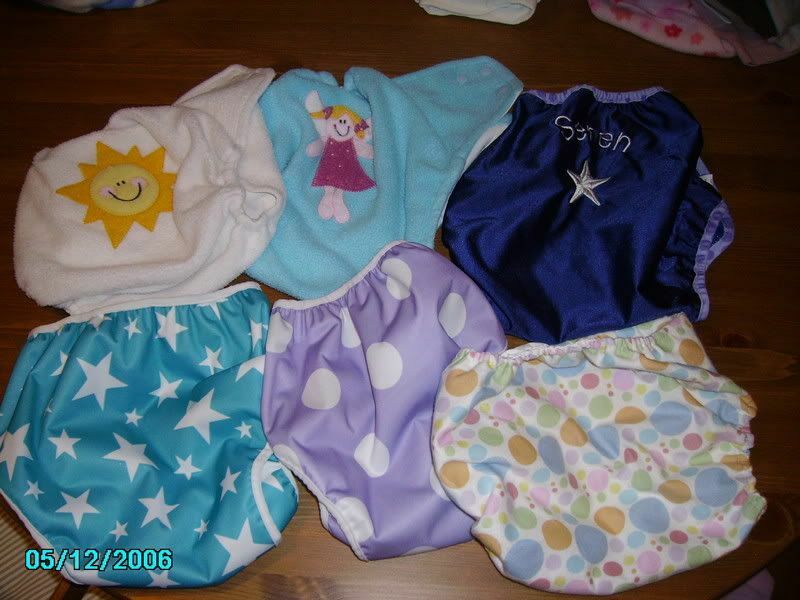 Edit: Here are a selection of Seren's nappies. 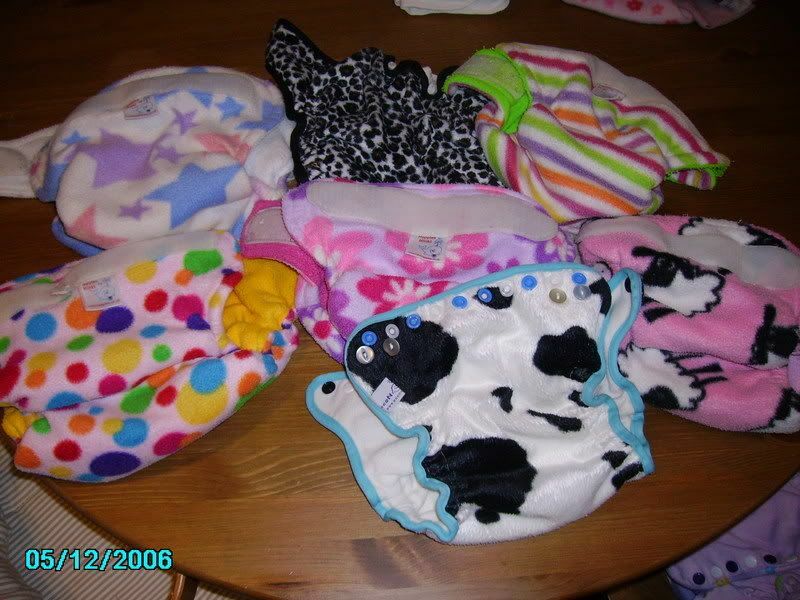 These are the pocket nappies, all are from minki except the snow leapord print and cow print which are from weenotions. These are Seren's nightime nappies. These are her day nappies, mainly from totsbots, weenotions, bumble, snugglebum. And over those I put a wrap. This is the waterproof bit. You can get some really funky ones. These are from weenotions, funkywraps, totsbots and there are a few WAHM ones too. Thank youl all so much for your help. It is an expensive option but very worthwhile. Hello its me with some questions. im looking to order some. but i need it as easy as poss. when they say AIO do i need any thing else? or just that nappy? They don't have a built in fleece liner, which I would probably use on one of those nappies to catch solids and also fleece is aquaphobic so any wee goes straight through it into the nappy and doesn't contact the skin. Ella is normally bone dry when she has fleece next to her skin. im looking for some that dont need wraps. just the nappy? can u get them like that?? when we met up in birmingham at the meet i seen Beanie show you the nappy seren had on it was pink and looked real soft thats the kind i would like rather then a wrap over the top?in the top pic the ones Beanie has posted do they need wraps? i really like the look of them? The ones in Beanies top pic are pocket nappies. They don't need wraps or liners. The outside bit that you see like the cow hide etc is what is on show. The only thing you need to do with those nappies is put something inside the pocket called a booster and you're ready to go. I really like pockets, they dry quickly as you take the boosters out when you wash them. You can get all in one nappies that don't need boosters, liners or wraps. But they aren't that absorbent. I used to have some magicalls which I used on Ella in the summer. They were just like a disposable in the way you just pop it on, except obviously you wash and reuse these lol. I wouldn't really recommend them for daily use though, they were great for when we were out and about, but they needed changing really regularly. i have just got one of these i have that insert and the nappy. do i need to use a wrap with it? and do i need to put a liner on? Hey, nope with the fuzzis you just put the insert/booster inside the pocket and away you go. The inside of the nappy is fleece (next to their skin so allows moisture to pass through into the insert, and the outside is waterproof so it contains it all inside the pocket). I really like them, we have a couple larges and I can still squeeze Ella in the mediums. See how you get on with it, you might find you need to use a couple of inserts to have a really absorbent nappy, but after you've used it a few times you'll be able to judge how long it will last. then i have some motherease coming soon so i will see which ones i get on better with its just trial and error at the mo, once i find the best kind il stock up on a few. 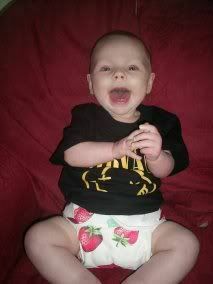 Harley lasts for hours in a nappy he dont wee alot but Dior soaks through within 3 hrs. would pocket nappies be best for night time and just stuff them up a bit? I use pockets at night, the ones I use are called minkis. http://www.babykind.co.uk/minkis.htm They're bulky, especially when padded out for the night, but we get on really well with them. They're all soft and fleecy, I put a prefold nappy inside (cheap way of boosting nappies you can get prefolds really cheaply from Ebay). Normally I wrap the prefold around another type of booster (terry towelling ones or microfibre) to give it extra absorbency. are they a bit to bulky for day time?? Oh Dionne, which motherease one have your ordered, one size or multi fit. I have heard a lot of good things abbout the onesize in terms of how well they work (if not that attractive) but Iwas shown them by my nappy advisor and they looked really wide between the legs. I have ordered the multifit ones in my nappy trial, you will have to let me know how you get on with them. Im also trying tots bots fluffles, bambozzles, and bumbles. I looked at the pocket nappies and they look good but I think work out the most expensive, cause you need to buy different sizes as they grow, and buy boosters for them. 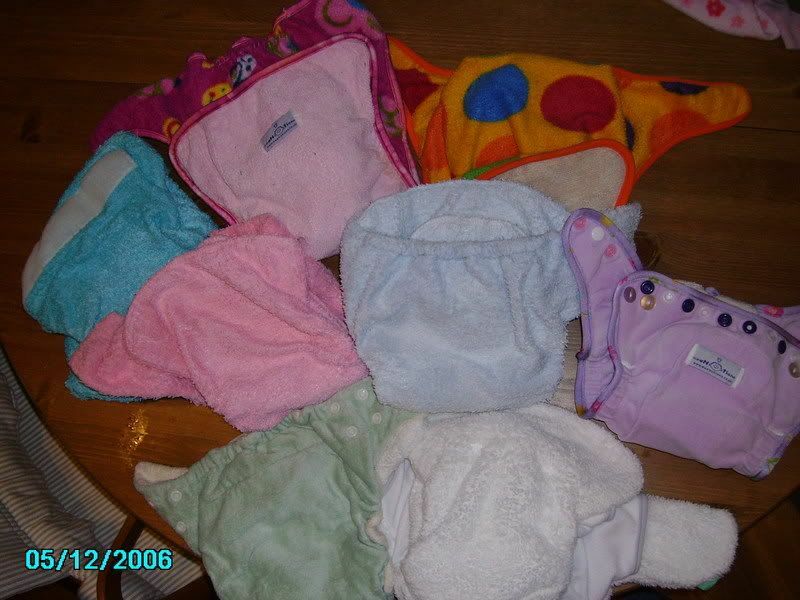 So Im looking at plain looking one size nappies, and then having a selection of funky looking wraps. You could use them in the day but you'd probably find it hard fitting normal clothes over them, Ella's a right fat bum in hers when she goes to bed at night With the fuzzis you'd get away with using large ones on both of your bubs, I'm sure. Cat you can get one sized pockets called Wonderoos. I've got quite a few of them. They have poppers to fold down for smaller babies. I've been using one of Ella's since she was 4 months old and it's still going strong, so I just bought a load of 2nd hand ones in unisex colours. I've been put off of using one sized normal nappies (not pockets) at first as I remember how tiny DD was when she was born and some of them are so big.